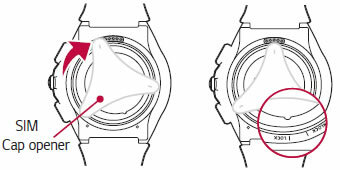 Place the SIM cap opener in the 3 holes located on the back of the watch. 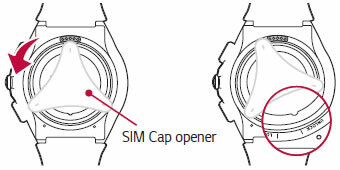 Align the SIM cap opener to the hole located at the bottom of the watch and then turn counter-clockwise until the SIM card cover direction indicator reaches the "UNLOCK" position. 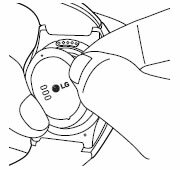 To remove the SIM card cover, hold the watch firmly in one hand. Press the outer corner of the SIM cap cover, the other side will lift. Then lift the SIM card cover with your finger. Slide the Nano SIM card into the SIM card slot, making sure the gold contact area is facing downward. Close the SIM card cover using the SIM cap opener. Align the SIM cap opener to the holes on the back of the cover then turn clockwise until the SIM card cover direction indicator reaches the "LOCK" position.